Sometimes a rigorous, guided hands-on experience with a professional is what is needed to catapult the wanna-be pinstriper and custom painter into the realm of hi-profile money making. The myriad aspects of custom paint for vehicles and motorcycles are all like pieces of a puzzle and even the professional painter can learn yet another tid-bit from the plethora of knowledge and experience from another to add to his tool kit of tricks and repertoire of techniques. The Custom Paint Boot Camp and Hi-Performance Graphic Tune-Up Workshop at Letterfly ArtPark in Florida provides an ideal situation for both the curious beginner and the accomplished artist seeking some one-on-one with industry professionals including Dave “Letterfly” Knoderer, known for traditional old school pinstripe designs, airbrushed murals, gold leaf designs, hand brushed portraits, wet blended and airbrushed pinup girls. 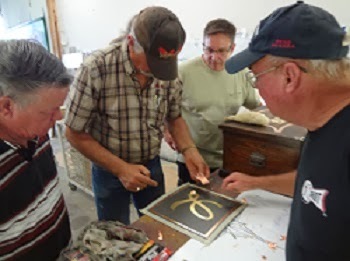 Paul Hetrick enjoys status as hand lettering master craftsman fluent with all aspects of the traditional sign maker journeyman from the age when everything was created by hand with paint. As sign painter extraordinaire, Paul shares knowledge from his intimate relationship with letterform and inspires with clean and proven design composition formulas. Industry products expert and statewide automotive finishes technical representative JR Brennan is on hand with cutting edge product knowledge and is a walking resource library accessing his career as automotive paint and body shop techniques advisor to the eastern seaboard. Students benefit not only from the extensive curriculum, the result of decades of creating a myriad of traditional hand painted works and for the ongoing opportunity to ask questions as they learn to manipulate paint into delicate designs, become familiar with the recipe and philosophy of combining aspects of color theory, viscosity ideals, and devices that provide special and unusual effects when used in surprising unconventional ways and embrace what paint pioneers do to efficiently handle the tasks of production and abundance. No better forum exists to get a leg up on a compete understanding of the mechanics of and the spectrum of; the variety of paints and products, the strategy of design, and the scope of paint manipulation techniques available to the aficionado of custom paint and vehicular decor. 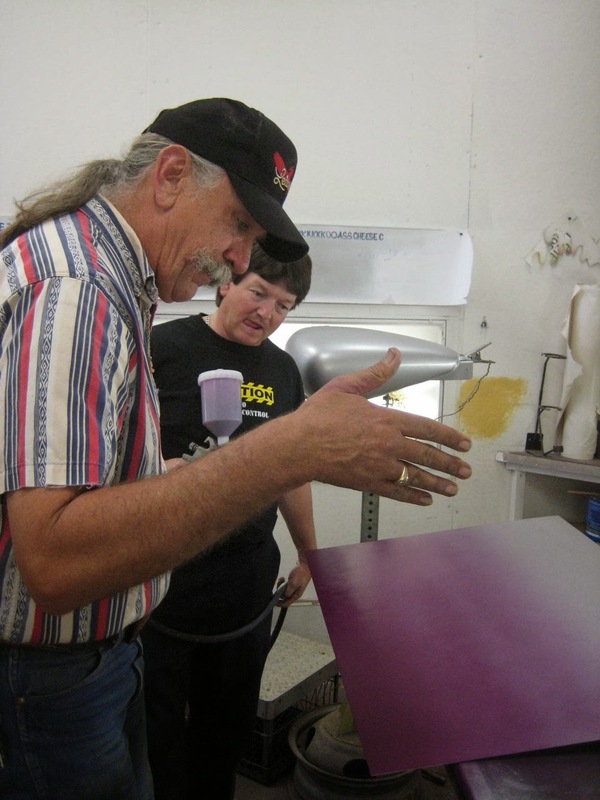 The instructional team at the ArtPark Custom Paint Workshop knows that the visual artist typically learns by being shown, combined with the opportunity to try, hands on, techniques that bring a project to life, step by step, all the way to completion by the end of the workshop. Be prepared to have a finished piece produced by yourself all the way to road ready during the time you are in class. The workshop syllabus has been divided into five logical specialties with a day designated to each discipline. Attend any day class of the subject that interests you or to optimize your ability, understanding, level of skill and jump start your career, stay for all five consecutive days and learn all aspects of this interesting opportunity for the creative personality. Any one day class is $225. with the best value being all five classes for $850. Make plans now to participate, add to your repertoire and be launched into the fascinating world of custom paint. Especially valuable for the custom bike builder is the special BYOB (Bring your own build) workshop that provides the missing aspect for a home builder that doesn’t have a proper paint facility. At Letterfly ArtPark, with supervision and a working paint shop, the proud craftsman has everything needed to personally complete every step of the paint job from prime and fill, color, graphic shape creation, special effects, final candies, pearls, pinstriping and décor and finished clear, plus cut and buff, to make the project completely his own. Understandably, to facilitate these projects, special consideration to reserve the entire shop during the winter months of December through March requires advance planning. Visit LetterflyPinstriping.com for more information or Call Kelly 813 752 8063 to reserve shop time.